Childhood is the golden age. This period is an ideal time to learn the basic keterampian, forming habits, and acquire the basic concepts that affect the next life. 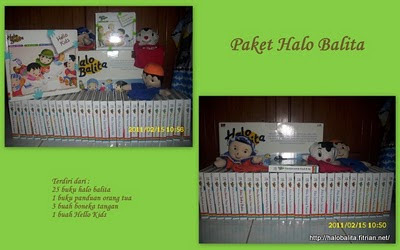 Halo Balita can help your child through the golden age. Black and white giveaway is held by Gaphe and Rifka. 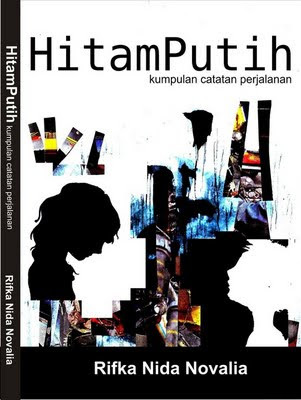 Rifka has published a book entitled "Black and White". This book contains a collection of notes of travel, life, love and a lot of things. This book is also based on personal experience. This Book - A collection of Travel Notes, Designed by Huda Tula. 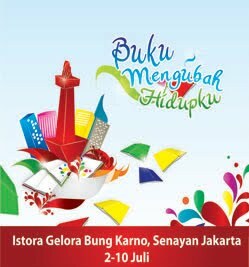 Jakarta Fair 2011 was opened on June 9, 2011 until July 10, 2011. Jakarta Fair is held at the Arena PRJ Kemayoran, Jakarta. Jakarta Fair this year is the 44 time, in order to commemorate the birthday of the City JakArt to 484. Jakarta Fair is expected to become the premier tourist and shopping destination for millions of visitors. With the theme "Jakarta Fair helped accelerate Improved Welfare of Indonesia. " With the hope to trigger increased investment and employment expansion. A variety of superior products in the country we can see in Jakarta Fair. This exhibition is also the largest exhibition in Southeast Asia. All products can be found here. When I was shopping at the market yesterday, I saw the mangosteen fruit seller. I do not know if it's unseasonably mangosteen fruit. Mangosteen fruit is one of my favorite fruit. I prefer the mangosteen fruit that is small compared to large mangosteen. Because the mangosteen fruit is small, the fruit can be eaten and no seeds. The purple mangosteen or better known as the mangosteen is an evergreen tree that originated from the tropics. Explanation of the evergreen tree is a plant that does not shed its leaves all at once in a season. Mangosteen fruit also known as the queen of fruit. I was one of a housewife who addict to the internet. Fortunately I have a husband who understands the needs of his wife at home. The most important all the housework can be done well, as well as children. On my birthday last September, was given an android phone that Samsung Galaxy Spica. It's good to not play. While my friends has a Blackberry now, I had offered to buy as well. But I rejected and think about it anymore. I would rather take a notebook to replace the old notebook because there are some keyboard is damaged. 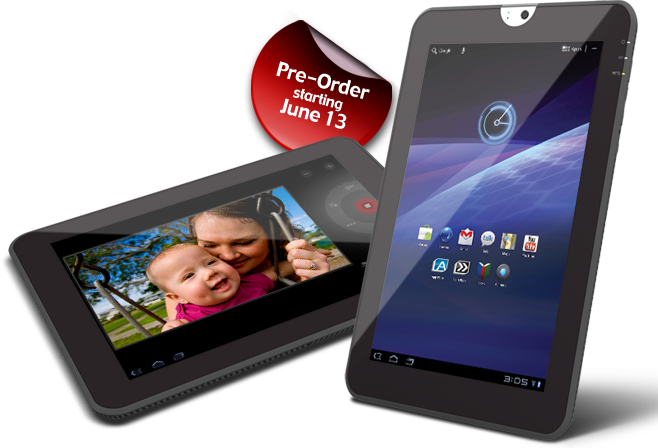 I saw Toshiba release tablet PC that is Thrive Toshiba 10 "Tablet. 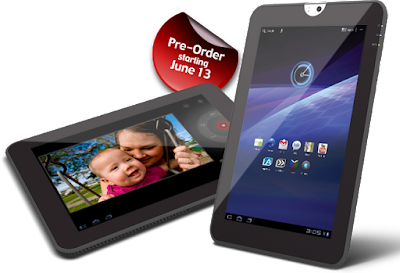 Tablets from Toshiba is powered by the Android 3.1 Honeycomb. You can browse the web, read ebooks and see movies and play games. all can be done comfortably. The book is a source of knowledge, from books we can obtain knowledge and knowledge without boundaries. As early as possible children should be introduced to the book. Starting from a love of books expected to love reading. For book lovers, do not miss the Jakarta Book Fair to be held at Istora Bung Karno, Senayan, Jakarta on June 2, 2011 until July 10, 2011. Jakarta Book Fair 2011 has the theme of the book Changing my life. Various kinds of books can be found there. Also various kinds of activities that you can follow that relates to the book of course. Miss Indonesia was held Saturday June 4, 2011 yesterday. 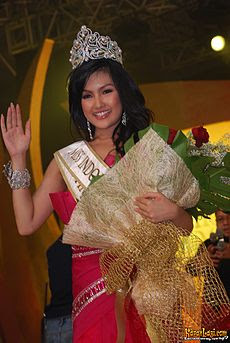 Astrid Ellena Indriana Yunadi elected Miss Indonesia winner 2011. She was born 8th June 1990 which fondly called by Ellen also won the miss beautiful skin and miss favorite. Ellen grew up in Surabaya and Gaithersburg has extraordinary intelligence. She always get the champion at the time of going to school. Ellen is very good in playing piano, now she enrolled at the University of Pelita Harapan with the Faculty of International Relations. Besides Indonesia, English and Javanese Ellen also mastered Spanish and Mandarin. Ellen will represent Indonesia in Miss World in November later in London, England. I hope Ellen can be reached for Miss World 2011. 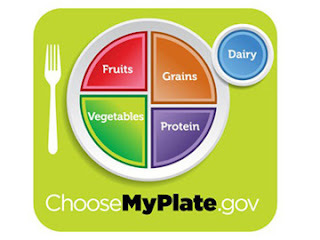 On June 2nd, 2011 Yesterday the USDA (United States Department of Agriculture) have replaced the pyramid nutrition with "My Plate"
With its icon-shaped plate with bright colors. My Plate has 4 sides of vegetables, fruits, grains and protein, on the right there are small circles represent milk and other dairy products. This icon is to help people adapt healthy eating habits every day. Change this icon no longer expected to misinterpretation and reduce obesity rates among young people in America. Because the new icon is very easy to understand. In each dish meal containing fruit and vegetables fresh. On My Plate USDA website recommends eating smaller portions, half of the plate should contain vegetables and fresh fruit and avoid sugary drinks. Nutritionists believe this campaign is the best option. Bogor City birthday is celebrated annually on June 3th, because on June 3th, 1482 is the day of the coronation of King Siliwangi as king of the Kingdom of Pajajaran. In Bogor, the city celebrates birthday-529. The city of Bogor, Bogor Palace will open to the public. For those interested in following this event can register with the Department of Culture and Tourism of the city of Bogor. 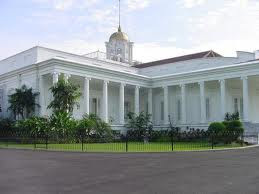 Bogor Palace which formerly Buitenzorg or Sans Souci, which means "No worries" is one of six Presidential Palace of the Republic of Indonesia. Have their own uniqueness because of the historical aspects, culture and fauna, one of which is the deer who come from Nepal. Open Palace Activities will be held on June 13, 2011 until June 16, 2011, followed on June 20, 2011 to June 21, 2011. This rule was created to teach the public that officials are also running the Palace during the rule that has been made. Dengue Hemorrhagic Fever (DHF) is a disease caused by dengue virus is transmitted through Aedes Aegypty mosquito,. This disease can cause bleeding if not treated quickly. For that we need to know this DHF prevention of disease by avoiding mosquito bites in the morning until late afternoon. Eradicate mosquito breeding so that the breeding of mosquitoes would be minimized. Fumigation and the provision of abate powder (temephos) in the cistern. Currently Google has launched a monitoring tool GOOGLE DENGUE TRENDS dengue in Indonesia, which also launched in 38 languages ​​and 5 countries. To celebrate the 484th anniversary of Jakarta, Festival Palang Pintu Held in Kemang. The event was held on 4 and June 5, 2011 along the road kemang highway, Jakarta. Various events have been prepared, starting from the art exhibition events, customs betawi, also culinary. There is a bazaar that sells various kinds of goods, like clothing, toys and antiques from betawi. Sales of tickets has been started since 17 April 2011. Line Up Concert: Super Junior, SS501 Park Jung Min, Girls Day, The BOSS, X-5. Boyband is already well known and many get this award will certainly entertain the people of Indonesia, especially for K-pop lovers. If your K-Pop Lovers certainly will not miss the show Korean Idol Music Concert Histed in Indonesia.